please see my plan and actual site photo which I have attached here. As you can see in photo I have a building in left side, which was made 5 years ago. It is made upon RCC pillers and beams. Now I want to make a new hall in right hand side, which you can see open land in photo. 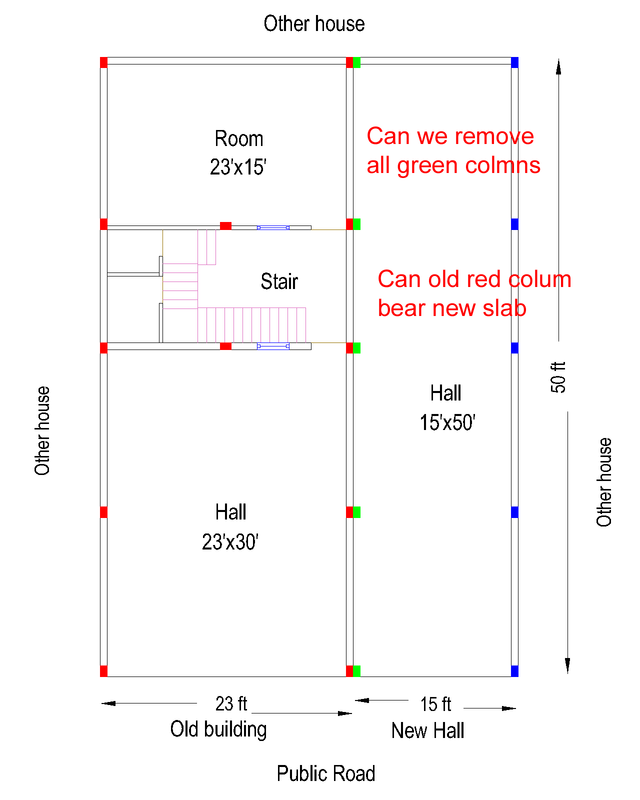 this hall will be 15 ft x 50 ft.
My question is, can I remove green color colms ( pls see Plan). can old colms bear the load of slab. How can new beam be rested on old colms. In future the whole building will be made upto first floor also. What type of help or information do you need. Did you find any solution for this ? I had a same situation like this and i am going to avoid old column. Please post your findings. Join date: Feb 2013 what is the size of your colms (OLD and new)? Why don’t you hire a civil engineer for a perfect plan rather than asking suggestions online because no one will have the right by watching the pics. Find a civil engineer from popular brillassignment services and show him your house plan and take suggestions from him so that it will help you to design much better and dream house.